If you’re anything like me, you love having pictures of your family all over your house. We have so many wonderful photos around our house but they are, mainly, in frames. Maybe one or two aren’t but, for the most part, what else do you do with them to display them? This is exactly what made this craft item so challenging for me. And I loved it! When I started just thinking about things we might need around the house, our dry erase board came to mind. It was getting pretty dingy, it was small, and our little family was starting to get pretty busy with Gav going to Pre-K, all his actives, and my husband and I wanting to volunteer more at church. My husband and I are always trying to keep up with the important dates and schedules and sometimes we just forget to tell the other or forget what the other told us. (That happens ALOT!) Then there is Roman’s little feeding schedule which is pretty open, but when my parents or in-laws babysit, it’s nice to have something for them to look at so they know what exactly he needs. That’s when I decided to chuck the old dry erase board and revamp a bigger one into a family info board. To get even sized pictures of each member of my family, I used Lipix (an app on my phone) to create one single image that I could cut up. This definitely works best if you have an even number of family members. Our printer is on the fritz so I sent it off to a store to be printed but you can use regular paper from your printer and save a $1.50. I had mine printed as a 5×5. Cut out each picture, I did a little extra trimming to allow for more room on the board, and laminate them. I used a heat laminator but they also sell self-laminating sheets if you don’t have one. Cut the picture out of the lamination and place a small piece of magnet on the back. My main reasons for using magnets instead of just taping/gluing them on are one, I didn’t want to ruin the board in case I eventually want to reuse it and two, the boys are going to change so I want to be able to change their pictures to reflect them. 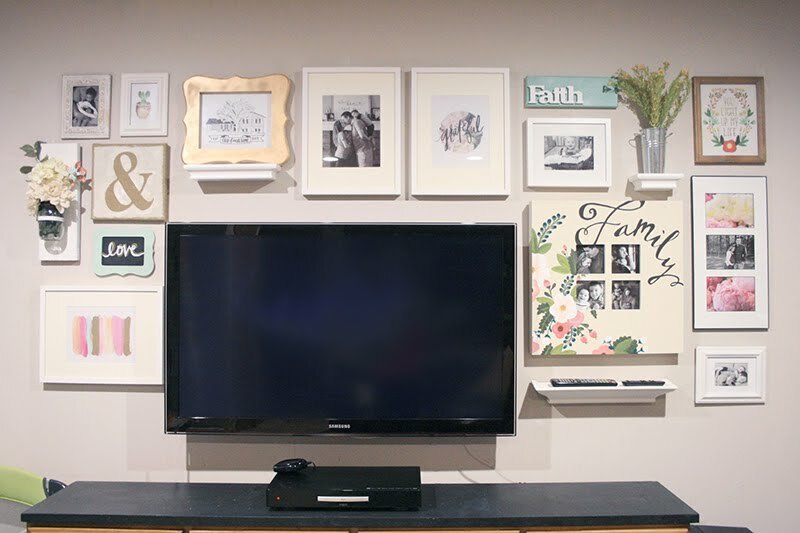 Using the washi tape, tape off a section for each picture and trim with an exacto knife. Now you have a place for each member and all of their info! I love how clean and simple this ended up looking. It really helps soothe my OCD. Ha! If you have any projects using your own fabulous family photos, come link up with us at the bottom of the post! We’ve been working on a our budget lately and have decided to really hone in on a few things. A lot of what we would like to do has to do with home improvements and those can cost quite a bit of dough! This doesn’t really leave much room to save for much else. However, we have budgeted a little weekly personal money for my hubby and I to do whatever we’d like. We each get $20 week for whatever. If that gets spent by Tuesday, then that’s it for the week. With this, I’ve decided to start saving for a new camera. My current one has been oh so good to me and was a Christmas gift about seven years ago. She’s on her way out though since technology updates itself just about every 5 seconds. Each week I’ll save some of my weekly spending money and, eventually, it’ll add up to what I need. The more diligent (read: self disciplined) I am, the quicker I can get it! So I thought, with this month’s challenge, I’d make myself something to collect it all and see the saving progress. Tape off a section of the container and paint on the chalkboard. Be sure to follow the directions for how many layers and how to cure it. While the chalkboard is drying, draw and cut out the money slot from the container lid. Sand down any rough edges. I originally, as you can see in the pictures, drew out a much smaller slot. As soon as I started cutting with the knife, it cracked but I made it work! Paint the lid if you wish or you can leave it as is. If you choose to paint it, use a sealant (i.e. Modge Podge) to keep it from peeling or cracking from use. Use the sharpie to write the words “saving for…” just above the chalkboard. Once the chalkboard section is ready to write on, fill in the blank with whatever you’re saving for! It may take awhile, but it’s going to be so exciting when I finally get it! What are you currently wanting to save for? Have a project that uses chalkboard paint? We’d love for you to share it with us by linking up below! It’s that time again! Time for our monthly craft challenge! This month, the craft item up for DIYing was fabric. I’ll admit that some items have had me scratching my head for a good while and then sometimes, like this one, an idea will just pop right up. Our basement bathroom is nothing short of plain. I mean, pllllaaaaiiinnnn. There’s nothing in there but the toilet, sink, and the old mirror from the previous owners. We just haven’t really gotten around to saucing that one up yet so I thought up a fun way to add some much needed color and boldness. Lay the canvas on the fabric, pattern side down, and glue the edges to the back and trim any excess. When you get to the corners, it’s easiest if you fold the fabric up as you would if you were wrapping a present. My canvas is 16×14 and 1/2 a yard covered it easily. Paint the letters and once they’re dry, glue them to the canvas. Simple yet bold and colorful! It may be the only piece of art in there, but it’s a step in the right direction. Do you have a DIY including fabric? We’d love for you to link up with us! So I was all set and ready to go with this challenge. I got to pick the item this month, I got a project in my head…and then I went for it. MAJOR FAIL! It’s that utter disappointment only an avid DIYer can feel when the project that looked so good in your head turns out looking like a hot hot mess. So there had to be a plan B. Well let’s just say that I am so excited with how this turned out that I’m not even upset (ok maybe still a little upset) that the first one didn’t turn out. Turns out there was a plan C too and I’ll share that in another post! Fill your container with water and dump the entire bottle of powder in it. Try to make the solution pretty saturated with color by having less water for the pigment to dissolve into but still enough to dunk in the canvases. Start dipping the canvases one at a time into the dye. When you pull them out, let the color run over the canvas in different ways to create the desired look. Set them aside to dry for about 10-15 minutes. Repeat the dipping/drying process, making sure you angel the canvases in different ways with each dip, as many times as needed until you reach your finished look. Once they are completely dry you can display them as is, write a fun message (this was for my mom so I wrote her a nice reminder), or you could even glue them to a bigger canvas or piece of wood for easier hanging. Have a project you’ve done and love that involves fabric dye? We’d love to see it! Be sure to link it up at the bottom of the post and visit my co-hosts as well to see what fabulous things they created. It’s that time again! Time for the Ready, Set, Craft Challenge! Our lovely co-host, Kerry, picked the very versatile mason jar for our craft item this month and, to be honest, I struggled a bit. I mean, there’s just so much to do with these that I couldn’t wrap my head around a full idea. So I did what I always do in these situations, when I’m looking for inspiration. I went to the craft store and literally stared at all of the jars. Yes I did! I probably look crazy whenever I do this but it really helps! So after staring for a few minutes, I decided that I definitely wanted to do something with the mini variety. I haven’t done a craft with them before and they were calling me. Then I did the next thing I always do, I strolled the aisles aimlessly looking at every single thing on the shelves. You think I’m kidding? Ask my hubby how long I spend in Hobby Lobby or Michaels! Fast forward through this entire trip and you get this super cute and fun mini pallet project! When I saw this little pallet, I knew I had to use it! Look at it, it’s so cute! Paint it, if you choose to, and set it aside. Fit the pipe clamps (you can find them in the plumbing section of any hardware store) onto the jars so that they sit comfortably in them. Not too tight that they tip and not too loose that they slip through. Screw the clamps into the mini pallet based on where they will hang. Be sure the measure them out first so that you have room for the plants. It helped to start the holes first and to stretch the slats in the clamps before attaching them. Attach the hanger to the back. I used one of these since I knew I wanted to to hang on my coffee station. However, you could easily put a couple of screws in the wall and hang the pallet without this little fixture. Arrange the plants into the sand or, if you’re going with the real thing, plant them however is necessary. I have a black thumb so I stick with the faux variety. Set the finished jars in their clamps and hang. Ready to play along?! We’d love for you the link up with us and show us your amazingly creative Mason Jar crafts! Can I just say, I am loving this challenge series! It’s forcing me to think outside the box since we’re purposefully picking very generic craft items. These are all items that I have used in previous DIYs so it’s really getting my wheels turning and getting the creative juices flowing! This month, Emily chose wood. Oh, the possibilities! I have to say that one of my favorite aisles of any craft store is the unfinished wood section. I could stand there and just stare for awhile, coming up with a million ideas on what to do with it all. Something I haven’t really used much, even though I look at them all the time, are the shapes. Small little baggies, hanging on hooks, filled with different shapes in all sizes. Then, when I looked at the circles, I was reminded of a recent play date with our besties when we played a memory game with the kids. Just some small circles with pictures on the back sides and I thought, “Hey! I can make this!” So I did! If you have a toddler or preschooler, you probably have about a million to a billion, half empty, sticker sheets lying around. If you get lucky however, you may be ale to find enough for this project! I had such luck and they happened to be one of Gav’s favorite things, dinosaurs! Separate your wood circles into pairs and place a sticker on each. Make sure you only use each picture once per pair. Brush a layer of Modge Podge over the top, let dry, and you’re ready to play! Super simple and a great, non screen related activity! Alrighty…it’s link up time! 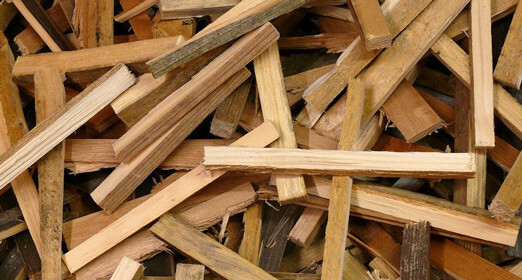 Have a project that involves wood? Link it up below. We’d love to see your creations…Happy Crafting! We’re back for another round of the Ready, Set , Craft DIY Challenge and this month’s craft item was yarn. Oh the possibilities, especially if you know how to knit, crochet, or weave. I don’t know how to do any of these things! But luckily, my mom knits and she has a lot of extra material for me to use for my project. But when you don’t know how to do the main things yarn is meant for, what do you do? You loop and tie! Here’s my version of a yarn wall hanging. Start with the yarn you plan to use in the center of your hanging. This is usually your biggest section, though it doesn’t have to be. Pull out a large amount in the longest you want your hanging to be. Snip any loops and even out the ends. To attach it to the ring, half the strands and lay the loop over it. Thread the rest through the loop and tighten as necessary. Since this yarn was so fluffy, I played around with different ways to use it. I tied the middle section a couple of times and fluffed it out some more. Now continue this with your different colors, shortening the lengths as you go. You can weave some through thicker yarn and alternate the different textures to get the desired look. Once you’ve finished tying the yarn on, lay it out flat. Be sure to comb through the strands so that they are laying flat and side by side. Use scissors to cut down the yarn in a “V” shape. Place your stick or piece of wood (mine is a thick branch from my backyard, washed off and dried) across the ring and wrap yarn around in an “X” to secure it. You can use a little hot glue to hold it in place too. I’m so thrilled with how this turned out! There are so many great options of yarn so the combinations are endless. Now it’s time to show us what you made with this month’s challenge item! Link up your yarn related posts below and check out some of the other fabulous DIYs. Be sure to come back on February 2nd for the link up! It’s here! The very first Ready, Set, Craft Challenge and our item was mini ornaments, just in time for the holiday season. Be sure to scroll all the way down to link up to see all of the fabulous projects, add your own, and find out what the next item is for the January challenge! First thing you’ll want to do is paint your hoop. Now, technically, this step is optional. If you like the look of the plain wooden hoop for your project, you can leave it as is. I wanted mine to be white so I chose to paint it. Be sure to paint all edges. You may notice in the pictures coming up that I forgot the inner hoop when I started so I had to go back and do that. Cut long lengths of ribbon, one for each ornament. The size of your hoop will determine how many ornaments will fit inside. My hoop is a 10″ and 5 ornaments looked best to me. 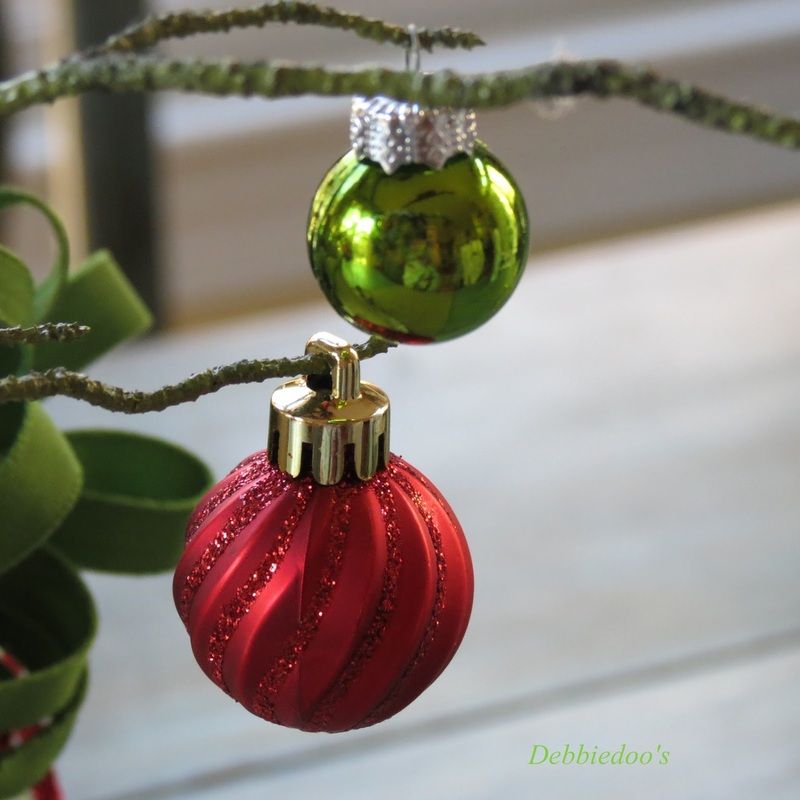 Thread the ribbon through the ornament and secure with a dot of glue. Cut off the excess ribbon. Once you’ve finished with each ornament, it’s time to add them to the hoop. Starting with the middle ornament (or the middle two if you have an even number), glue the ribbon to the inner hoop. Now glue the rest of the ornaments, in varying lengths, around the center one(s). Place the outer hoop on top and tighten it. Using some left over ribbon, make small bows and glue to the front side of the ornament. A larger ribbon bow on top finishes it off to hang and display. I used a pre made gift bow since all of the Christmas merchandise is 50% off at Hobby Lobby! This could also make a great door decoration as well! Let us see what you’ve created in the link up below and on social media. Use the hashtag #readysetcraftchallenge to show us your stuff! Now get those crafting pants on, get you some yarn, and come back for more January 5th! I’m so excited to finally share with you a new project I’ve been working on its a few other fabulous bloggers! We are starting a fun monthly DIY challenge and you’re invited to join in on the fun. Each month we will choose a generic craft item for everyone participating. All you have to do is get that item and get crafty with it! Then, on the first Tuesday of each month, we’ll have a link up for you to share what you came up with. So go get your DIY on and come back December 1st to see what my co-hosts and I made!